In 1988 he graduated from Kharkov Order of Lenin Aviation Institute after N.E. Joukovsky (KhAI), specializing in the Vehicle propulsion systems. Since 1998 worked at RSC Energia, namely was engaged in the elaboration of flight documentation and the development test of the EVA equipment and procedures in conditions simulating weightlessness on the Selen stand and neutral buoyancy in CTC hydrodynamics laboratory; participated in the Service Module prelaunch processing on the EVA and teleoperation control mode issues; took part in the ISS crews training for EVA; supervised EVAs on the ISS at MCC; participated in the sea crew training for DM water landing; was a member of the maintenance team of DM in the landing area; was a member of the test team as a test worker in Orlan-M-GN; EMU spacesuits and a safety diver in the light-weight diving gear. On March 29, 1996 he was selected as a candidate for test cosmonaut from TsSKB-PROGRESS by decision of the State Interdepartmental Committee. From October 1998 he has passed training as a member of the cosmonaut group under the ISS flight program. From January 1999 he has been a test cosmonaut of OAO RSC Energia. From December 2001 till April 2002 he passed training together with G.I. Padalka in the Soyuz TM-34 backup crew (the ISS third visiting crew). From March 2004 till March 2006 he passed training in the cosmonaut group under the ISS flight program. From March 2006 till March 2008 — training with S.A. Volkov and NASA astronauts Garret Reisman and Gregory Chamitoff in the ISS-17 prime crew for a space flight. From December 2009 till October 2010 — training with S.A. Volkov and NASA astronaut Ronald Garan in the ISS-25/26 backup crew. From October 2010 till July 2011 he passed training as a backup crew member of ISS-28/29 and a comander of Soyuz TMA-02M manned spacecraft. On January 22, 2011 by order of CTC chief he was assigned to CTC cosmonaut detachment as a test cosmonaut. From June till December 2011 he passed training as a prime crew member and a comander of the Soyuz TMA-03M, a flight engineer of the ISS-30 and a comander of the ISS-31. From January 2013 till November 2014 he passed traning as a backup crew member of the ISS-42/43. From November 2014 till July 2015 passed training as the ISS-44/45 prime crew flight engineer and a comander of the Soyuz TMA-17M. Since November 2016 Oleg Kononenko was appointed as a ROSCOSMOS’ cosmonaut team comander. Since January 2017 he trained as a backup crew mwmber of thr ISS-56/57. Expedition 17. He performed his first space flight from April 8 to October 24, 2008 as a flight engineer of the Soyuz TMA-12 TMV, a flight engineer of the ISS-17 prime crew. During the flight he performed two EVAs on July 10, 2008 and on July 15, 2008 of the total duration of 12 hr 15 min. The flight duration was 198 days 16 hours 19 minutes 48 seconds. Expedition 30/31. 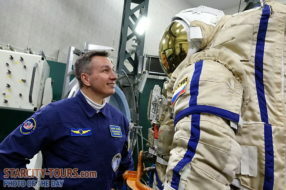 Oleg performed his second space flight from December 21 to July 01, 2012 as a commander of Soyuz TMA-03M manned spacecraft, a flight engineer of the ISS-30 and a commander of the ISS-31. During the flight he performed one spacewalk. The flight duration was 192 days 18 hours 58 minutes 37 seconds. Expedition 44/45. Kononenko performed his third space flight from July 23 to December 11, 2015 as a commander of Soyuz TMA-17M manned spacecraft, a flight engineer of the ISS-44/45. The flight duration was 141 days 16 hours 16 minutes 46 seconds. Hero of the Russian Federation.